Anchor memorial commemorates H.M.A.S. Canberra and those who served in her. In 1942 during World War Two, the Australian heavy cruiser HMAS Canberra was lost in action in the Solomon Islands at the Battle of Savo Island, some eighteen hundred kilometres off the North Queensland coast. Eighty four crewmen lost their lives. Crippled in a short but ferocious engagement with a force of Japanese cruisers in the early hours of the morning, the Royal Australian Navy ship was abandoned and sunk at 8 a.m. by allied vessels before they withdrew from the area. 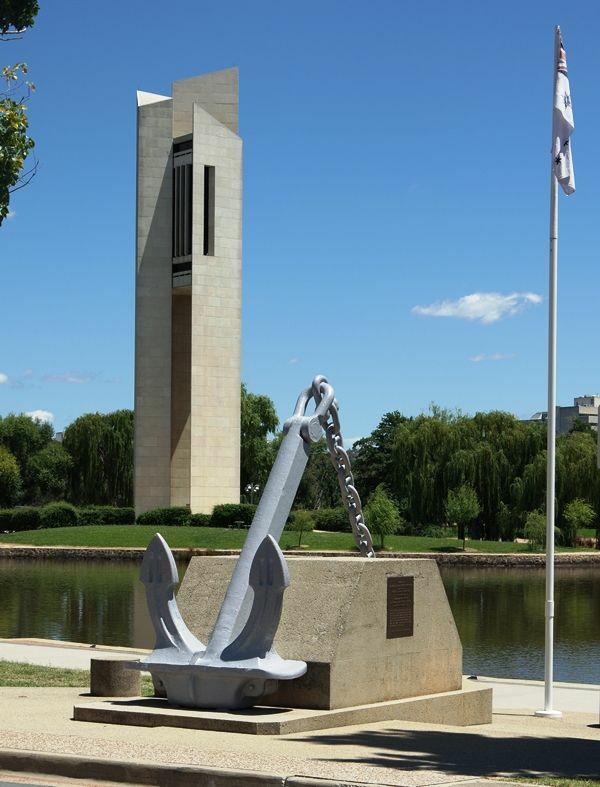 An imposing memorial to the first HMAS Canberra, which was sunk in battle during World War II, was unveiled yesterday by the Chief of Defence Force Staff, Admiral Sir Anthony Synnot. 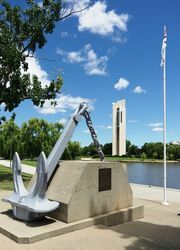 The memorial is a five-tonne anchor and chain, of the type normally carried by a naval cruiser, which was a gift from the Royal Australian Navy. It has been mounted on a concrete podium on the shore of Lake Burley Griffin near the Carillon. Yesterday was the 39th anniversary of the sinking of the Canberra, which went down on August 9, 1942, after being attacked by Japanese ships in the battle of Savo Island. Eighty four of her 816 crew members lost their lives. 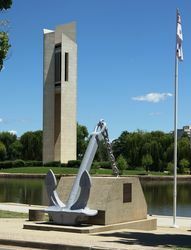 The memorial was erected by the ACT Chapter of the Naval Historical Society of Australia, with assistance from the Canberra Shropshire Association of Australia. About 400 people, including 100 members of the Canberra-Shropshire Association, attended the dedication ceremony. The Canberra Times,10th August 1981. JOHN BROWN & CO. LTD. CLYDEBANK SCOTLAND. LAUNCHED BY H.R.H. PRINCESS MARY ON 31 MAY, 1927. LENGTH: 630FT. BEAM 68FT. 4IN. DRAUGHT 22FT. 4IN. ARMAMENT: EIGHT 8IN., FOUR 4IN. AA, FOUR 2 POUNDER POM-POMS, FOUR 3 POUNDERS, EIGHT 21IN. TORPEDO TUBES. SUNK AT THE BATTLE OF SAVO ISLAND ON 9 AUGUST 1942, WITH THE LOSS OF 84 LIVES. AC, KBE, CB, DSC, RAN, (RET). THIS MEMORIAL WAS ERECTED BY THE A.C.T.